A blog for the creation of a game for Capstone 2 for Northeastern University. So we've mentioned before that we had to cut some content in order to meet our deadlines, I wanted to talk about what was cut and why we decided to cut it. 1. Characters - We were originally aiming for 9 playable characters. The intern and 8 recruitables. We cut this to a total of six characters. It came down to two things major time consumers. The first is the actual character art. Designing and drawing the characters was a big time sink for Julia. Additionally after the initial design we'd go back and refine. The second was the technical art and particle effects for the skills. This was actually a huge time sink, and Kiril was the only one on the team who could do it well. At the end of the day we needed Kiril on other things and we proffered refining our other characters and making more set pieces. 2. Procedural Content Generation - Oh boy. This one was a doozy. So we actually decided to cut PCG not based on the difficulty in programming, but rather the difficulty in game design. We were really worried that it would be way too time consuming to tweak our level generator to make levels fun and good. That combined with the short amount of playtime game demo day participants would have led us to hand design our levels instead. 3. Equipment - We wanted equipment for our characters. It would allow players to customize their characters a bit and rare equipment finds would make playthroughs more exciting. Unfortunately this came down to just not having enough dev time. We actually had a system where characters could have equipment that modified their stats implemented. However there were a lot of other things we needed to do. We needed equipment to drop, we needed equipment to be switchable at certain points, and we would ideally also need equipment to be sellable. All of this added up to too much additional work that we simply couldn't justify. The dev time was better spent elsewhere. 4. Currency - We really wanted currency to be a huge resource that the player had to manage. Currency would allow the player to buy experience for characters, equipment, and heal characters. Unfortunately like equipment we just didn't hae the time to implement all the things to make currency feel good. We could have implemented some of the basic stuff, but by the end of Lifelike we were pretty set on having everything in our game look and feel good. If we had implemented currency it would have been pretty sloppy. Yesterday was Game Demo Day, aka our final presentation for Lifelike. It went really well. It was pretty amazing seeing some people really enjoy our game. It really made all of this hard work worth it! One thing that really made us proud was people actually learning and understanding our game well. We had a couple of people play who have never played a strategy RPG like Lifelike. These players were confused at first, but picked it up pretty quickly. This was immensely rewarding to us as it was one of our biggest concerns coming into GDD. We ended the day with two first place awards and two second place awards, notably we won best overall game. We felt pretty proud of this. We've worked a ton over the past three months and it seriously feels so good to be done. We're still figuring out what we're going to be doing with Lifelike, but ultimately we had a great semester. So, in thinking about how to create a trailer for our game, I realized that game footage wouldn't be too exiting on its own. Now there's a live action trailer for Lifelike. Called "Livelike". It's not done yet, but I hope you enjoy the teaser image! We're fully into polish mode for our demo for Game Demo Day at this point. We keep telling ourselves we're content locked, but new things keep sneaking their way in. It has come to our attention that most people won't immediately know how to play our game upon seeing it (weird, right? ), so I've been thinking about what we can do to create a condensed tutorial for our condensed demo. So, I wrote up a design for a tutorial, but ended up getting way too into it and accidentally made it out of scope (woops). There's little chance that this will be ready for game demo day, but designing it with the demo in mind actually led me to figuring out ways to streamline the tutorial for the eventual full game. The tutorial essentially only introduces players to the basic controls and game flow, leaving the rest to the players to learn for themselves. It also does a good job of introducing the player to the tone and narrative in the way without getting bogged down in exposition. Anyway, check out the design doc for the tutorial after the break. We're gearing up for Game Demo Day and you know what that means!? POLISH. We're trying to make our game look and feel better while eliminating any bugs we find along the way. We've done some sweeping changes to make the UI a lot better and to make combat text more readable. So we're getting in some semblance of dialog for our next big playtest on Monday. Robby and I worked together to come up with a system for storing the first type of dialog called comments. Comments are simple forms of dialog that only involve one character (as opposed to conversations which involve multiple characters). Comments come in two types. The first are idle comments. Idle comments are going to have a chance to trigger at any time. The second type is triggered comments. Triggered comments have a chance occuring after their trigger condition is met. Some example trigger conditions are BasicAttackHit and SpellCastRank1. Now to actual handle this I'm creating an XML reader that will parse through xml documents and store the comments internally. Robby and I spent some time this afternoon coming up with the correct structure and making sure we were both on the same page. Robby will be able to directly edit the xml rather than having to go searching through other files and this will streamline our dialog pipeline. Just realized that we never made a post about our very first playtest! We've been pretty ambitious about the stuff we want to include in our game, so everyone's been really focused on working rather than typing up fancy word-posts. That's the excuse we're going with, at least. Anyway, we had our first playtest a couple weeks ago, and we got a lot of valuable feedback. A lot of it was what we expected, but that was still valuable in reinforcing our internal playtesting. Contrary to the lack of blog posts recently, we've been working hard toward our next major milestone. Our "Three Floor Demo" is due for testing on March 10th, and we're well on our way to making it happen. As we're all a bunch of nerds with no Spring break plans, we're working extra hard this week to meet all our goals for the demo. This, of course, excluded Evan and Julia, as they go to schools that for some reason decide to have their Spring breaks during the actual Spring time (weird, right?). This doesn't mean that they aren't working hard; just that we get to make them feel bad by working extra hours because we have nothing better to do. The 9 playable characters for the games have just been finished skill and stat wise. We've still got a lot of work to do with the art side, but we'll be giving some sneak peaks on some of the characters in future posts. Stuff like art, their techniques, their combat style, and their back story will be shown. Time for round two! This continues where the first post left off, discussing the design for the dialogue system in Lifelike. This second half discusses the two different large categories of dialogue: Event Dialogue and Idle Dialogue. 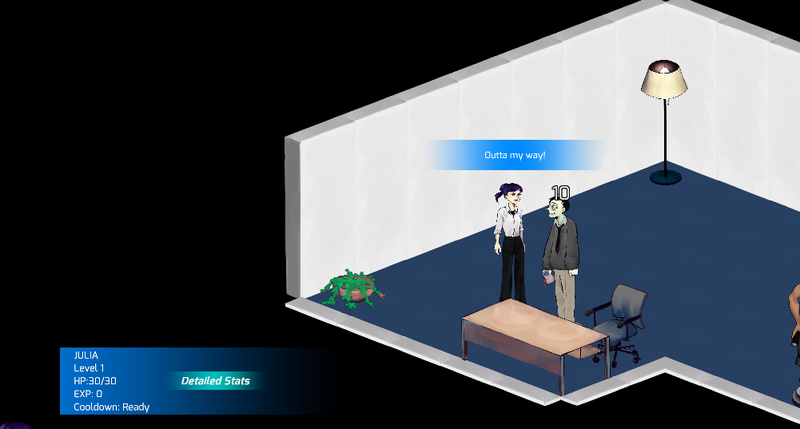 Lifelike is a turn-based, tile-based, team-based, hyphenated-classifications-based rogue-like RPG in which the player takes control of an intern climbing her way to the top of an increasingly other-worldly office building. Our design focuses on creating a unique, fast-paced combination of the best aspects of tactical RPGs and roguelikes, while also providing a meaningful, unintrusive, and integrated narrative experience. Oh, and it's heavily rooted in satire, so don't worry about us taking ourselves too seriously. With such a small team, everyone is essentially contributing to every part of the process, so take these titles with a grain of a spice of your choice.